Note: This post was originally published on April 2, 2015. It has been updated to reflect the current admissions and enrollment cycle. So you just received a communication that you’ve been offered a spot on the U-M waitlist. We know – it’s likely not the response you were looking for when you applied for admission to the university. When it comes to college admissions, you receive a final decision of admit, deny or waitlist. 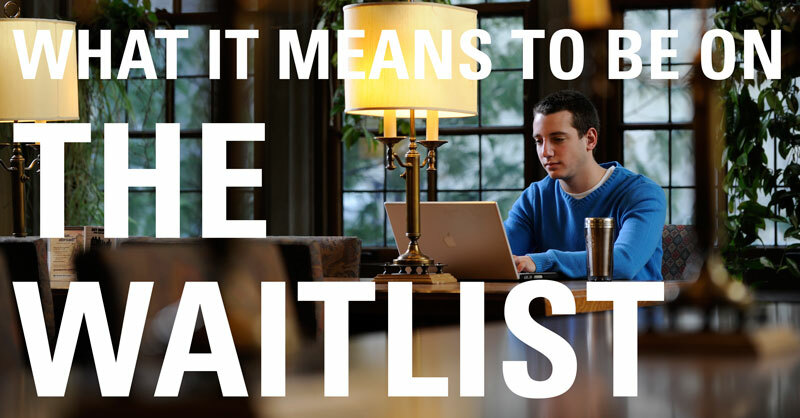 A waitlist means that, although the university considers you well-qualified, there were simply not enough spaces in the particular school or college to which you applied. It comes down to the competitiveness for limited spaces. So until your school or college finds out how many offers of admission have been accepted – which it will after the enrollment deposit deadline of May 1 ­– you’ve been invited to wait. If a space opens up, you could be chosen to fill it. You would know, most likely, by the middle of June. We know you want things settled as soon as possible, and so do we. But we want to make sure we’re offering opportunities to as many interested students as we can. That’s why you’re only under consideration if you accept the spot on the waitlist. Click on the Students tab, then go to the New & Prospective Student Business link and log in with your Friend Account ID. If you accept, that’s fine; you’re on our waitlist. But this is very important to know – nothing is guaranteed. Your first responsibility is to yourself and your future. Even if you accept a spot, make sure you secure a place for yourself at another university or college that you’re enthusiastic about and that has extended an offer of admission. Make the necessary enrollment response to ensure you're part of their fall 2017 freshman class. Accepting a spot on our waitlist does not bind you to U-M.
And remember this: There is only so much room for so many students, and that always varies. If you don’t make it in, know there are other years, and other options – like transferring, for instance. Our web site has information on the transfer process, including transfer credits. We’re not saying never – we’re just saying not now.